Merry CHRISTmas from Art of Eloquence! Art of Eloquence has never done anything like this in the entire eight years we've been in business! Studies and research show that effective communicators are happier and have deeper relationships than their less articulate counterparts. The Bible is FULL of scriptures (hundreds and perhaps thousands of them) that instruct us in the proper use of our mouths, lips, tongue and words. This because our communication either promotes peace or invites war. It was for this reason that I wrote 21 Days to More Godly Communication and it is for this reason that I created a secret page link on that eBook where I continue to write scripture-based communication articles to this day! We believe that studying what the Lord says about how we communicate with each other can bring peace to our marriages, friendships, families and co workers! 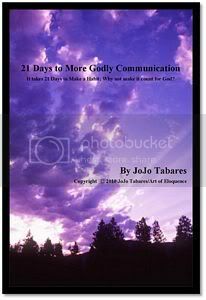 As part of our CHRISTmas gift to our customers, subscribers and friends for the next 21 days (the 21 days before CHRISTmas) we'd like to offer 21 Days to More Godly Communication absolutely free! This year my church, North Ridge Community Church, had begun work this year on becoming a B.I.G. church. No. Not big in size, but B.I.G. as in Biblical, Influential, and Grace-Based. North Ridge has been striving to become more of a meeting place for our local community. Our goal is to complete our common areas next year in order to better house community events so we may have more of an opportunity to minister and bless our community while leading them to a deeper or first knowledge of Christ Jesus. To that end I am prayerfully asking you to consider making a donation when you download your free copy of 21 Days to More Godly Communication. To read more about North Ridge Community Church, our Ridge Bridge Outreach, 21 Days to More Godly Communication and be download your free CHRISTmas copy of 21 Days to More Godly Communication, click here! This is a wonderful gift, JoJo. I hope many take advantage of it. I mean, come on, how many other vendors out there are giving away a $30 book for Christmas? And this one is an ongoing study, too. Kinda like “The Song That Never Ends.” LOL Seriously, you have a huge heart and this is a most wondrous Christmas gift to everyone.